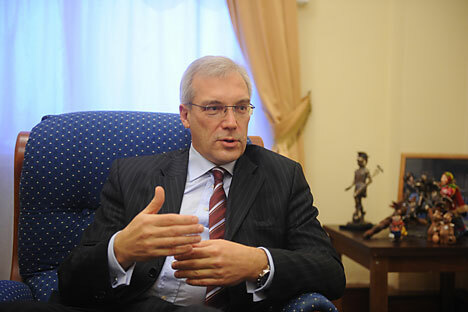 Russian envoy to NATO Alexander Grushko. Moscow is ready for the resumption of the dialogue in the framework of the Russia-NATO Council, Russian envoy to NATO Alexander Grushko has said. "On our own part we are ready to discuss any subjects that are related to the security of all members of the Russia-NATO Council," he said in an interview with Moskovsky Komsomolets daily published on Jan. 29. "Presently, an active debate is under way at the NATO headquarters, on the subject of the possible resumption of the operation of the Russia-NATO Council (NRC)," he said. "There are delegations that are interested in it, and openly speak of the importance of keeping the NRC dialogue venue. There are also those who would want to bury the Russia-NATO Council, and together with it, all of the understandings and obligations that alliance members undertook," Grushko said. "But I think that the majority at NATO realizes that the quality of security in Europe directly depends on the state of relations between Russia, and NATO, and consequently, on the foundation of which they were built," the Russian diplomat added.